In the new film The Wings of the Dove, the costumes by Charles and Patricia Lester threaten to outshine the stars whom they bedeck. Lucille Grant unpicks the story. 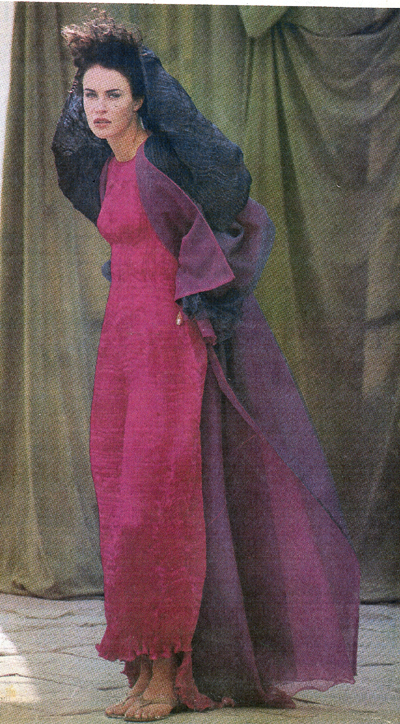 The film’s costume designer, Sandy Powell, wanted to recreate the authentic costumes of the 1930s for the many scenes set in Venice and knew that Charles and Patricia’s designs would replicate the contemporary clothes of the period: “I had used one of the Lesters’ dresses some years ago and knew their work,” she explains, “the colours were beautiful and I wanted something similar to Fortuny.” The latter is a parallel often drawn but when Patricia Lester started designing 25 years ago she was unaware of the work of the pioneering Venetian craftsman Mario Fortuny, whose pleated silk sheaths shot to fame in the early years of this century, and are now collectors’ items. “We have often been compared to him, but when we began I didn’t know he existed,” says Patricia. 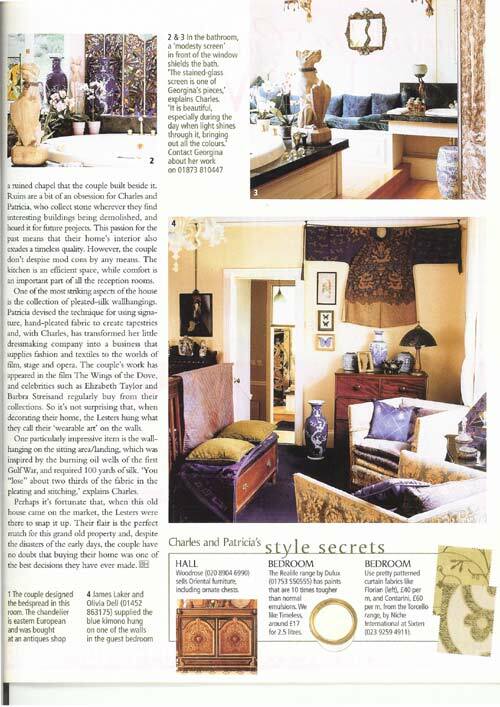 Charles and Patricia do not consider themselves fashion designers, but artists and craftworkers. 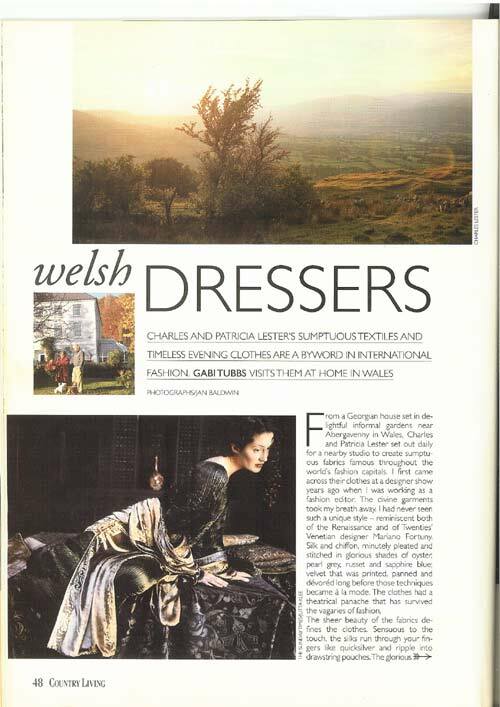 They create all their fabrics, clothes and soft furnishings from an idyllic location in Abergavenny, Wales. This setting suits them both perfectly and Charles says: “We like the tranquillity and have never wanted to move away.” Everything is produced in the quixotically-named “Workhouse”, an old Victorian workhouse, and their large Georgian house nearby in the picturesque valley of the River Usk. Like all great couturiers they are dedicated to their craft. 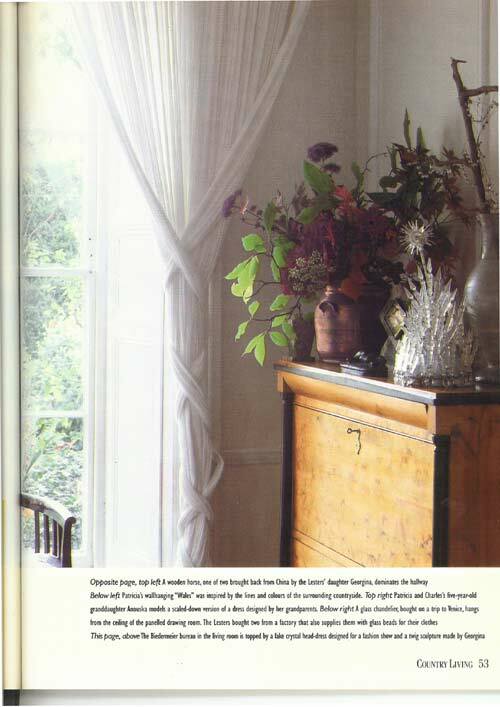 “We explored our own techniques of dyeing the fabric, then added crude pleats which we ironed out to create a tree-bark effect,” says Patricia. 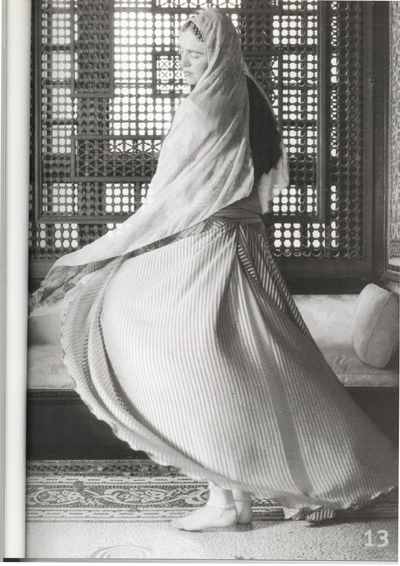 “It took two years to refine the process, in order to avoid the rigidity of machine-pleats and create a fabric that would mould around the body without clinging.” Like Fortuny’s famous plissé treatment of pleats, the process is now a closely guarded secret. The Lesters’ collection is shown only in Paris and they are one of the best-selling labels in Neiman Marcus and Bergdorf Goodman in America, as well as Liberty in London. 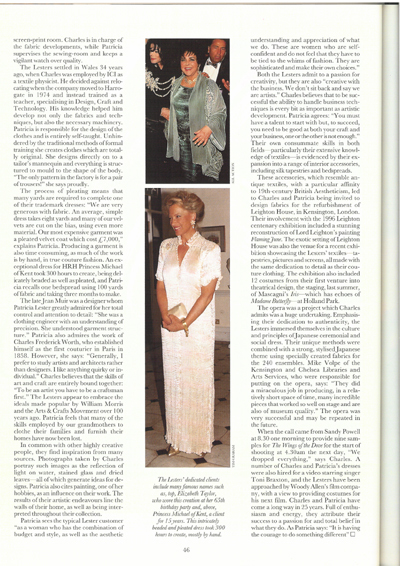 An impressive client list includes HRH Princess Michael of Kent, who has been a dedicated customer for 15 years, Barbra Streisand, Elizabeth Taylor, who wore a pale-green velvet robe over a finely pleated dress to her 65th birthday party this year, and Sian Phillips who recalls: “About five years ago, having admired the Lester clothes for some time, I asked the designer of a film I was working on if she would buy or hire a dress for me to wear. Once I put it on there was no question of my returning it and I bought it on the spot. Since then I have gradually acquired a small, cherished collection. It’s heaven being able to pack full evening dress into an overnight bag!” British television star, Pauline Quirke, recently chose the “Anybody” jacket – so named because it suits anybody – in “ember” (burning-coal red) in Design, Craft and Technology. His knowledge helped him develop not only the fabrics and techniques, but also the necessary machinery. Patricia is responsible for the design of the clothes and is entirely self-taught. Unhindered by the traditional methods of formal training she creates clothes which are totally original. She designs directly on to a tailor’s mannequin and everything is structured to mould to the shape of the body. “The only pattern in the factory is for a pair of trousers!” she says proudly. The process of pleating meant that many yards are required to complete one of their trademark dresses: “We are very generous with fabric. An average, simple dress takes eight yards and many of our velvets are cut on the bias, using even more material. 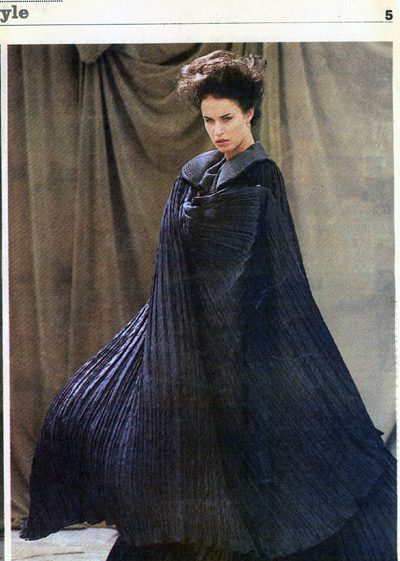 Our most expensive garment was a pleated coat which cost £7,000,” explains Patricia. Producing a garment is also time consuming, as much of the work is by hand, in true couture fashion. An exception dress for HRH Princess Michael of Kent took 300 hours to create, being delicately beaded as well as pleated, and Patricia recalls one bedspread using 100 yards of fabric and taking three months to make. The late Jean Muir was a designer whom Patricia Lester greatly admired for her total control and attention to detail: “She was a clothing engineer with an understanding of precision. She understood garment structure.” Patricia also admires the work of Charles Frederick Worth, who established himself as the first couturier in Paris in 1858. However, she says: “Generally, I prefer to study artists and architects rather than designers. 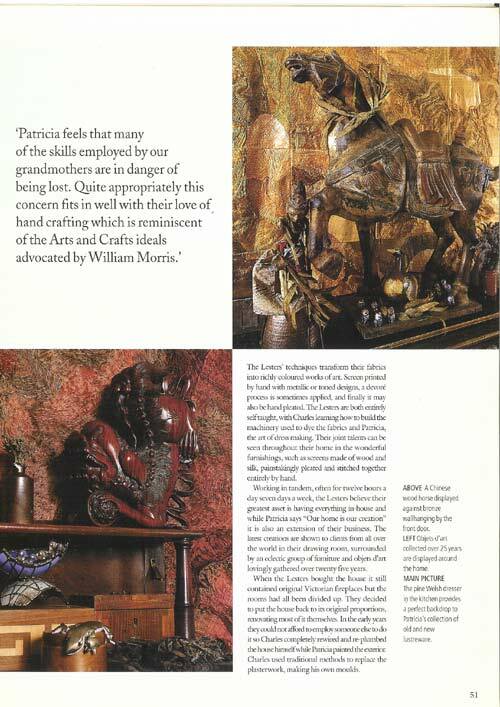 I like anything quirky or individual.” Charles believes that the skills of art and craft are entirely bound together: “To be an artist you have to be a craftsman first.” The Lesters appear to embrace the ideals made popular by William Morris and the Arts & Crafts Movement over 100 years ago. Patricia feels that many of the skills employed by our grandmothers to clothe their families and furnish their homes have now been lost. In common with other highly creative people, they find inspiration from many sources. Photographs taken by Charles portray such images as the reflection of light on water, stained glass and dried leaves – all of which generate ideas for designs. 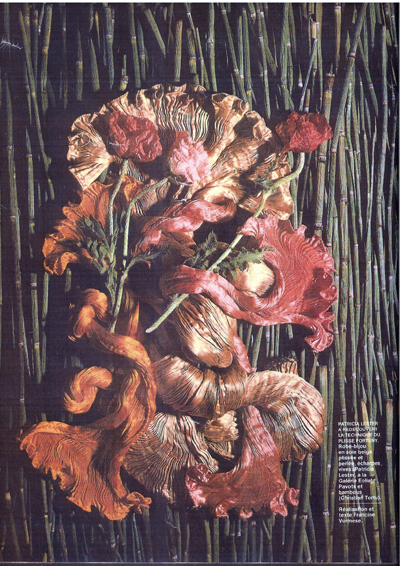 Patricia also cites painting, one of her hobbies, as an influence on their work. The results of their artistic endeavours line the walls of their home, as well as being interpreted throughout their collection. Both the Lesters admit to a passion for creativity, but they are also “creative with the business. We don’t sit back and say we are artists.” Charles believes that to be successful the ability to handle business techniques is every bit as important as artistic development. Patricia agrees: “You must have a talent to start with but, to succeed, you need to be good at both your craft and your business, one or the other is not enough.” Their own consummate skills in both fields – particularly their extensive knowledge of textiles – is evidenced by their expansion into a range of interior accessories, including silk tapestries and bedspreads. 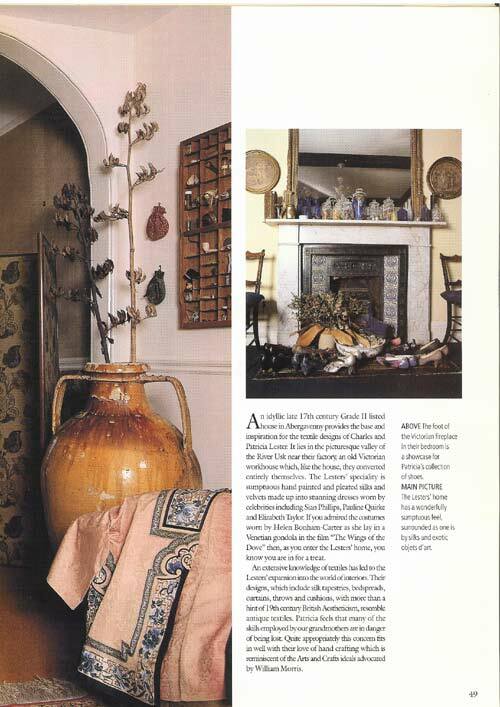 These accessories, which resemble antique textiles, with a particular affinity to 19th-century British Aestheticism, led to Charles and Patricia being invited to design fabrics for the refurbishment of Leighton House, in Kensington, London. Their involvement with the 1996 Leighton centenary exhibition included a stunning reconstruction of Lord Leighton’s painting Flaming June. The exotic setting of Leighton House was also the venue for a recent exhibition showcasing the Lesters’ textiles – tapestries, pictures and screens, all made with the same dedication to detail as their couture clothing. 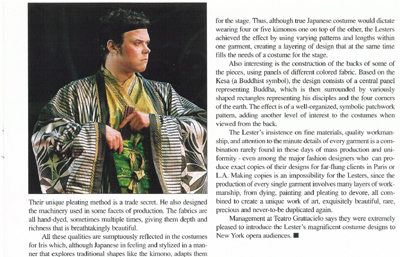 The exhibition also included 12 costumes from their first venture into theatrical design, the staging, last summer, of Mascagni’s Iris – which has echoes of Madame Butterfly – at Holland Park. The opera was a project which Charles admits was a huge undertaking. Emphasising their dedication to authenticity, the Lesters immersed themselves in the culture and principles of Japanese ceremonial and social dress. 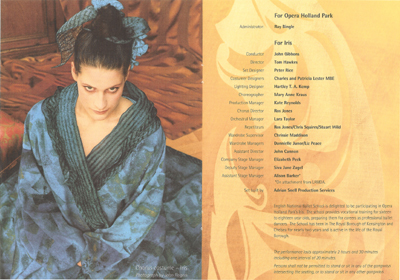 Their unique methods were combined with a strong, stylised Japanese theme using specially created fabrics for the 240 ensembles. Mike Volpe of the Kensington and Chelsea Libraries and Arts Services, who were responsible for putting on the opera, says: “They did a miraculous job in producing, in a relatively short space of time, many incredible pieces that worked so well on stage and are also of museum quality.” The opera was very successful and may be created in the future. 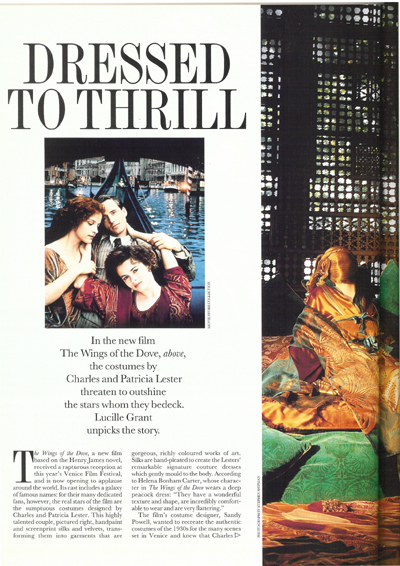 When the call came from Sandy Powell at 8.30 one morning to provide nine samples for The Wings of the Dove for the start of shooting at 4.30am the next day, “We dropped everything,” says Charles. A number of Charles and Patricia’s dresses were also hired for a video starring singer Toni Braxton, and the Lesters have been approached by Woody Allen’s film company, with a view to providing costumes for his next film. Charles and Patricia have come a long way in 25 years. Full of enthusiasm and energy, they attribute their success to a passion for and total belief in what they do. 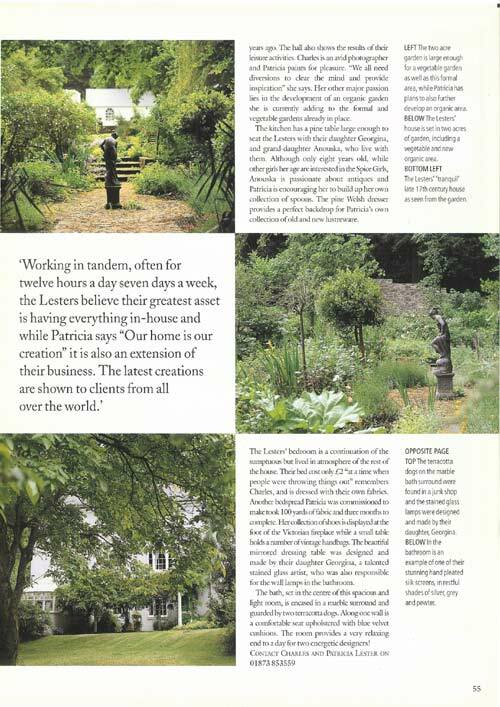 As Patricia says: “It is having the courage to do something different”. 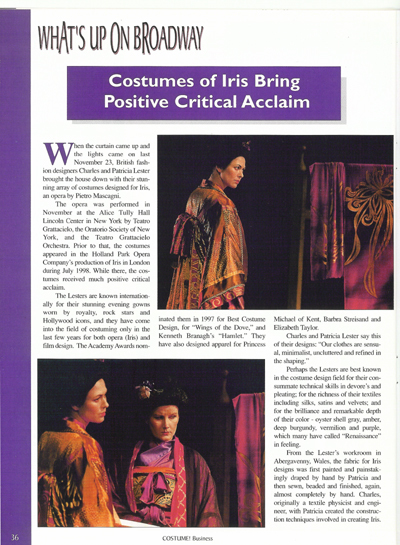 Pictures: Previous pages: left, one of the Japanese-style costumes created for the opera “Iris”, a satin kimono in copper-gold inset with red silk, worn over a red-ember robe tied with a silk obi; right, one of the scene-stealing stars of the film “The Wings of the Dove” a pleated-silk vest dress, shown with a tailcoat in rainbow silver. 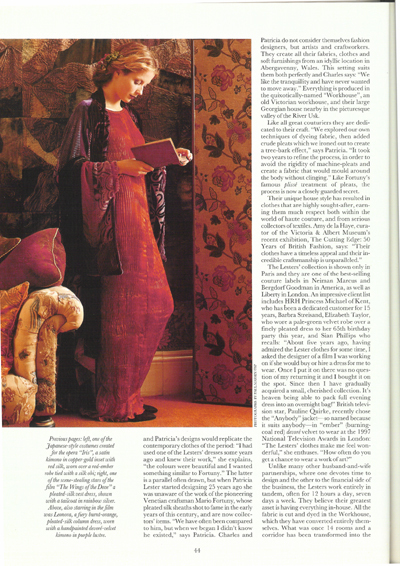 Above, also starring in the film was Leonora, a fiery burnt-orange, pleated-silk column dress, worn with a handpainted devoré-velvet kimono in purple lustre. The Lesters’ dedicated clients include many famous names such as, top, Elizabeth Taylor, who wore this creation at her 65th birthday party, and, above, Princess Michael of Kent, a client for 15 years. This intricately beaded and pleated dress took 300 hours to create, mostly by hand. A forgotten opera will provide a fitting stage for the Lesters, two of Britain’s best yet least known designers. Hilary Alexander reports. 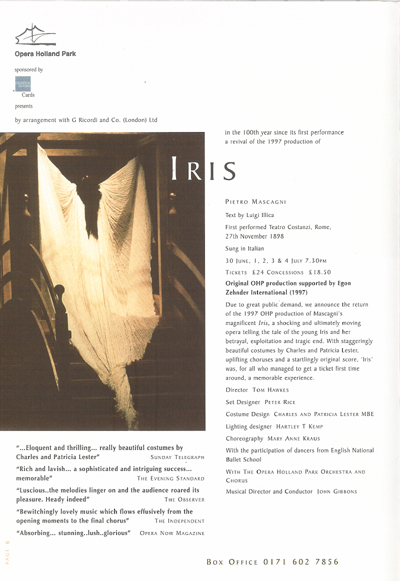 As the aria rises in crescendo, Patricia is “enfolding” 20 yards of the white-and-gold hand-painted silk net that will form a stupendous kimono for his love interest, Iris of the title, around an obliging dummy. Towering above her, on rails 20ft high, dangles a dazzling wardrobe for samurais, priests, geishas, goldfish-girls and fishermen. 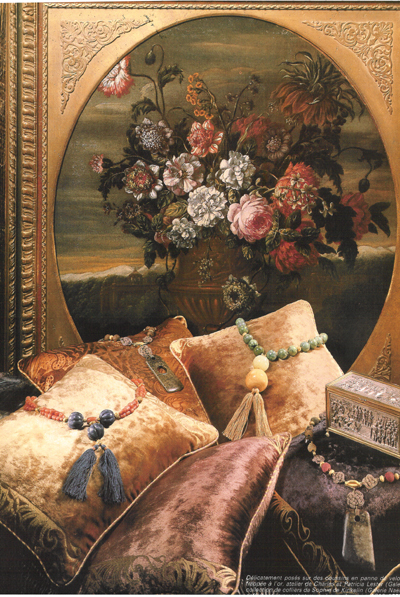 In jewel tones and porcelain pastels, mosaics of silk and devoré-velvet, their satin-trimmed hems and lantern sleeves trail on the wood floor. Each piece is a work of art; hand-dyed, hand-pleated, hand-made with the same love and care that Patricia, 54, and husband Charles, 55, devote to their £3,000-£4,000 arts-and-crafts gowns. Next week, a cast of nine principals, three dancers and a 40-strong chorus will be wearing the costumes for Opera Holland Park’s production of Iris, the first full-scale production of Mascagni’s great opera in Britain since 1919. 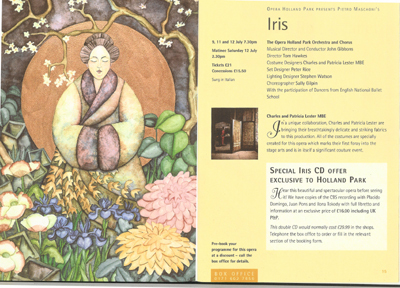 The project is the result of a chance meeting between the Lesters and Michael Volpe, of Holland Park Theatre, at Liberty last year, but the Lesters believe it was fated: years ago, Patricia bought an antique kimono decorated with irises at a charity auction. Today the Lesters are one of the best-selling couture labels for Neiman Marcus, Bergdorf Goodman and Saks Fifth Avenue in America and at Liberty in London. 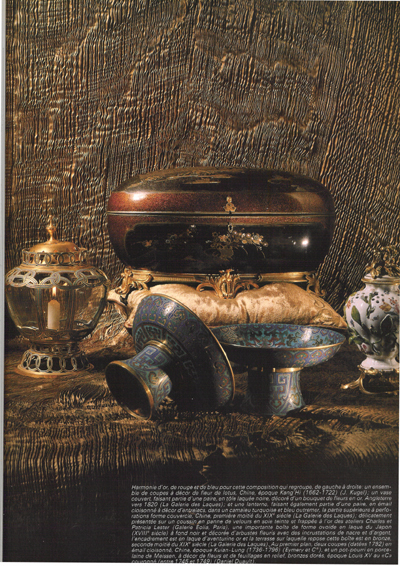 Their private customer file includes Barbra Streisand, Angelica Huston and Diana Ross, along with assorted nobility. Some customers arrive by private plane and spend £13,000 without blinking a mascara-ed eye. But although they own a vintage Rolls-Royce and a rambling Grade II-listed house in 8½ acres of woodland outside Abergavenny, French or Italian-style “designer-wealth” has eluded the Lesters. The designs have always been more important. And next month, the cast of Iris will introduce them to a brand-new audience. Diva Drama Double-layer rose-pink and lilac organza hooded coat, inspired by ‘Iris’, is in the new Charles & Patricia Lester collection. Underneath: ‘Princess Leonora wedding dress’, hand-dyed in ‘disgusting pink’, hand-pleated and with beaded neckline, £3,432. Flat gold thongs, £45, from Bertie. 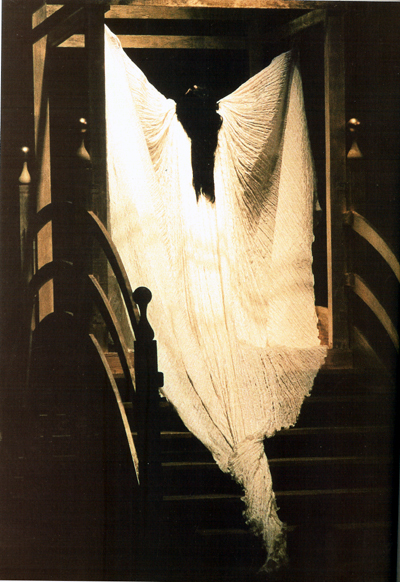 Dance of Death Twenty yards of ‘Black Tulip’ silk were whipped into a cloak by Charles and Patricia Lester for dancer Christopher Lewis to wear on the opening night of Opera Holland Park’s production of Mascagni’s opera ‘Iris’. Mother-of-pearl earrings by Slim Barrett, £54, from Harrods. Fantasy Kimono White silk net kimono, hand-printed with gold irises, will be worn by soprano Susan Stacey, singing the title role on opening night. Sterling silver/mother-of-pearl necklace, by Slim Barrett, £165. Samurai Chic Crêpe-back satin trousers, worn by ‘Iris’ chorus, also available in the main collection, £338. Hand-pleated, tarnished-gold silk vest, £546. Ethiopian cuffs, £225 pair, from Talisman Gallery, Harvey Nichols, SW1. 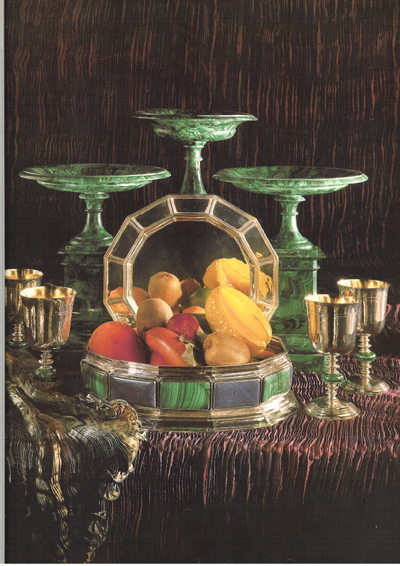 Les couleurs chatoyantes prune et mordorée des panneaux de soie naturelle teintée et plissée à la main dans les ateliers de Charles et Patricia Lester (diffusion Galerie Eolia, Paris) mettent merveilleusement en valeur la malachite de ces trois couples sur pied, travail russe, dix-neuvième siècle (J.Kugel), auxquelles répondent les coupes en argent avec bague en malachite, le plat octogonal en argent et le centre de table en argent à pans coupés ornés de malachite et de lapis lazuli (Buccellati). Harmonie d’or, de rouge et de bleu pour cette composition qui regroupe, de gauche à droite : un ensemble de coupes à décor, de fleur de lotus, Chine, époque Kang’Hi (1662-1722) (J.Kugel) ; un vase couvert, faisant partie d’une paire, en tôle laquée noire, décoré d’un bouquet de fleurs en or, Angleterre vers 1820 (La Galerie des Laques) ; et une lanterne, faisant également partie d’une paire, en émail cloisonné à décor d’entrelacs, dans un camaïeu turquoise et bleu outremer, la partie supérieure à perforations forme couvercle, Chine, première moitié du dix-neuvième siècle (La Galerie des Laques) ; délicatement présentée sur un coussin en panne de velours en soie teinte et frappée à l’or des ateliers Charles et Patricia Lester (Galerie Eolia, Paris), une importante boîte de forme ovoïde en laque du Japon (dix-huitième siècle) à fond noir et décorée d’arbustes fleuris avec des incrustations de nacre et d’argent, l’encadrement est en laque d’aventurine or et la terrasse sur laquelle repose cette boîte est en bronze, seconde moitié du dix-neuvième siècle (La Galerie des Laques). 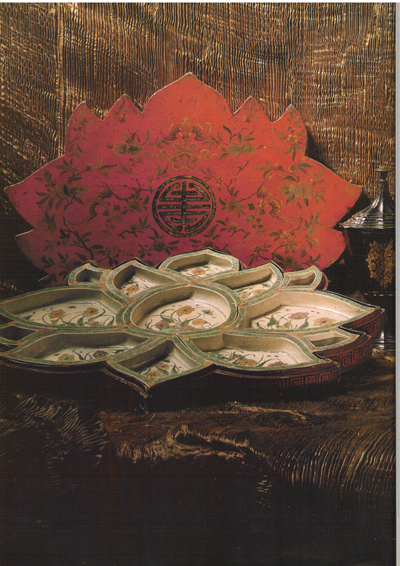 Au premier plan, deux coupes (datées 1792) en émail cloisonné, Chine, époque Kuian-Lung (1736-1796) (Eymery et Cie), et un pot-pourri en porcelaine de Meissen, à décor de fleurs et de feuillages en relief, bronzes dorés, époque Louis XV au « C » couronné (entre 1745 et 1749) (Daniel Duault). Les joyaux les plus raffinés et les plus précieux se lovent au creux des plis de ces panneaux en soie naturelle (Galerie Eolia, Paris). De gauche à droite : clips « Nœud » en or jaune et diamants (Boucheron) ; boîte ovale en or et émail dont le médaillon représente des personnages, Paris 1775, maître orfèvre Michel René Bocher (Au Vieux Paris) ; boîte rectangulaire à cage en or, chaque face est ornée de miniatures signées Xavery, Paris 1767, maître orfèvre Jean Marie Tiron dit Tiron de Nanteuil, orfèvre bijoutier du Roy (Au Vieux Paris) ; broche « Chardon » à trois branches en or jaune, or rose et argent (Buccellati) ; boîte rectangulaire en or, nacre et émail, Paris 1750, maître orfèvre Paul Robert (Au Vieux Paris) ; broche « Papillon » dont le corps est formé par une perle baroque et les ailes par des brillants (Buccellati) ; de Buccellati également, une broche « Noisette » en or rouge, jaune et en argent ; boîte à cigarettes en deux ors à motif de vannerie (Boucheron) ; boîte ovale en or et émail à décor herborisé, Paris 1778, maître orfèvre Louis Joachin Colmet de Courty (Au Vieux Paris) ; clip « Nœud » à pavage de diamants (Boucheron) ; clip « Chouette » en or, brillants, brillants jonquilles, onyx et émeraudes (Van Cleef et Arpels) ; broche « Noisettes » en or rouge, jaune et argent (Buccellati) et trois feuilles clip en or et brillants (Van Cleef et Arpels). 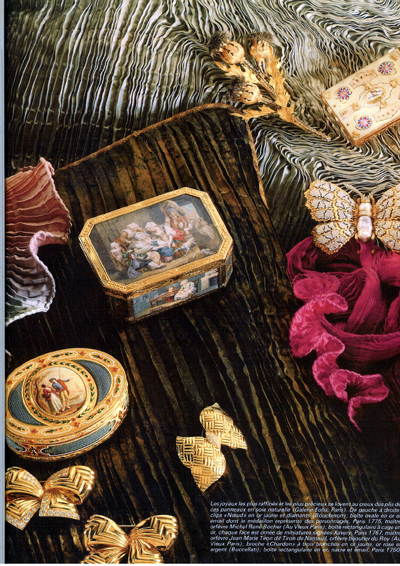 Délicatement posés sur des coussins en panne de velours en soie teinte et frappée à l’or, atelier de Charles et Patricia Lester (Galerie Eolia, Paris), une collection de colliers de Sophie de Kinkelin (Galerie Naëlla de Monbrison) ; le coffret est en argent et vermeil, travail parisien 1819-1838 (Edouard de Sevin) et un tableau de fleurs dans un vase en bronze doré sur fond de paysage boisé par Pierre-Nicolas Huillot (1674-1751) (Daniel Duault). 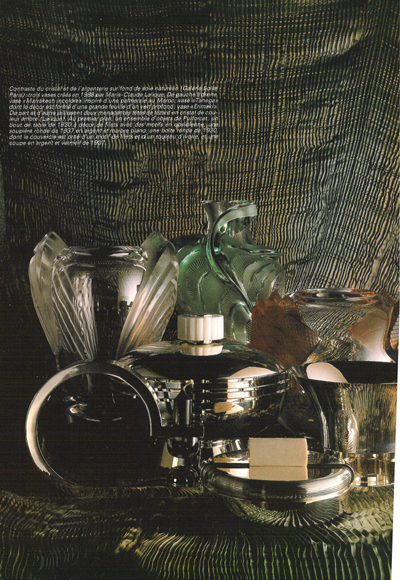 Contraste du cristal et de l’argenterie sur fond de soie naturelle (Galerie Eolia Paris) : trois vases créés en 1988 par Marie-Claude Lalique. De gauche à droite, vase « Marrakech incolore » inspiré d’une palmeraie au Maroc ; vase « Tanega » dont le décor est formé d’une grande feuille d’un vert profond ; vase « Erimaki ». De part et d’autre jaillissent deux menaçantes têtes de lézard en cristal de couleur ambre (Lalique). 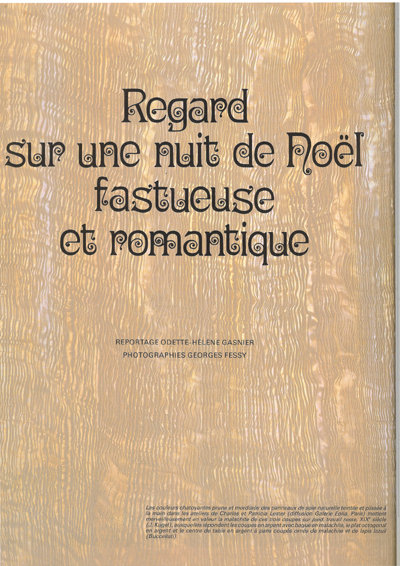 Au premier plan, un ensemble d’objets de Puiforcat : un bout de table de 1930 à décor de filets avec des motifs en obsidienne ; une boite ronde de 1930, dont le couvercle est orné d’un motif de filets et d’un rouleau d’ivoire, et une coupe en argent et vermeil de 1937. 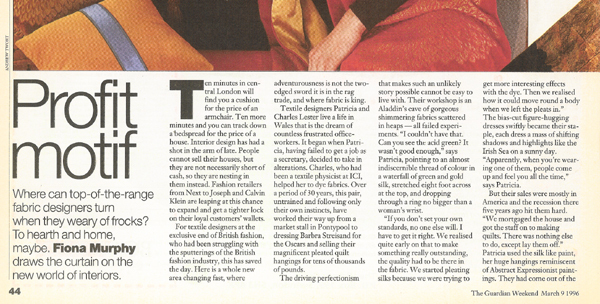 Where can top-of-the-range fabric designers turn when they weary of frocks? To hearth and home, maybe. 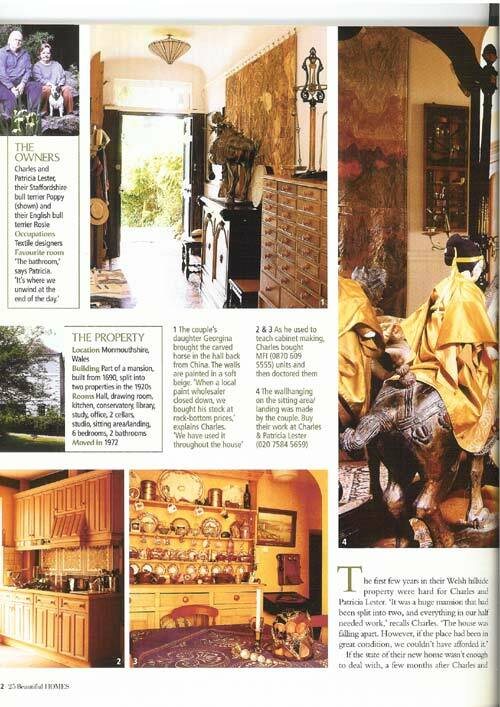 Fiona Murphy draws the curtain on the new world of interiors. Ten minutes in central London will find you a cushion for the price of an armchair. Ten more minutes and you can track down a bedspread for the price of a house. Interior design has had a shot in the arm of late. People cannot sell their houses, but they are not necessarily short of cash, so they are nesting in them instead. Fashion retailers from Next to Joseph and Calvin Klein are leaping at this chance to expand and get a tighter lock on their loyal customers’ wallets. For textile designers at the exclusive end of British fashion, who had been struggling with the sputterings of the British fashion industry, this has saved the day. Here is a whole new area changing fast, where adventurousness is not the two-edged sword it is in the rag trade, and where fabric is king. 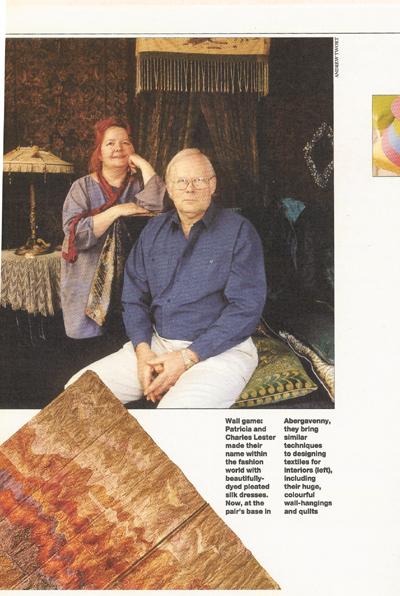 Textile designers Patricia and Charles Lester live a life in Wales that is the dream of countless frustrated office-workers. It began when Patricia, having failed to get a job as a secretary, decided to take in alterations. Charles, who had been a textile physicist at ICI, helped her to dye fabrics. Over a period of 30 years, this pair, untrained and following only their own instincts, have worked their way up from a market stall in Pontypool to dressing Barbra Streisand for the Oscars and selling their magnificent pleated quilt hangings for tens of thousands of pounds. The driving perfectionism that makes such an unlikely story possible cannot be easy to live with. 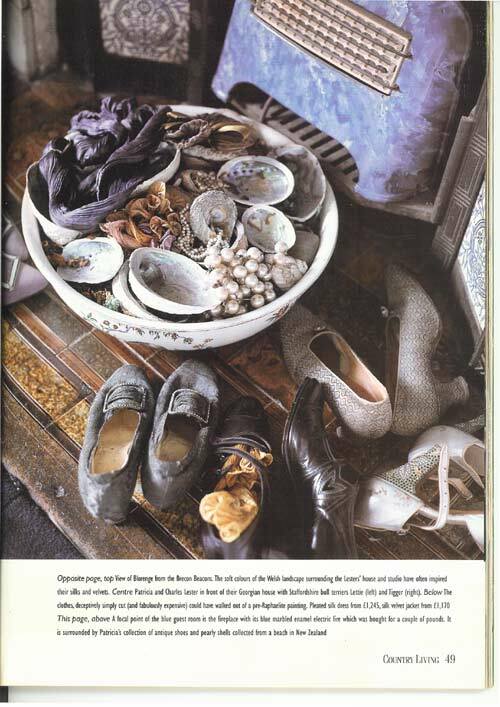 Their workshop is an Aladdin’s cave of gorgeous shimmering fabrics scattered in heaps – all failed experiments. “I couldn’t have that. Can you see the acid green? It wasn’t good enough,” says Patricia, pointing to an almost indiscernible thread of colour in a waterfall of green and gold silk, stretched eight foot across at the top, and dropping through a ring no bigger than a woman’s wrist. The bias-cut figure-hugging dresses swiftly became their staple, each dress a mass of shifting shadows and highlights like the Irish Sea on a sunny day. “Apparently, when you’re wearing one of them, people come up and feel you all the time”, says Patricia. But their sales were mostly in American and the recession there five years ago hit them hard. 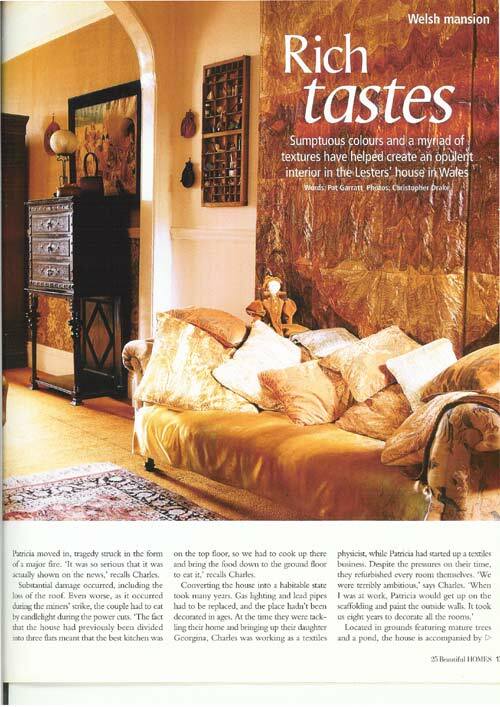 Patricia used the silk like paint, her huge hangings reminiscent of Abstract Expressionist paintings. They had come out of the lean years with a new direction. Neisha Crosland was meteorologically successful as soon as she left the Royal College of Art eight years ago. 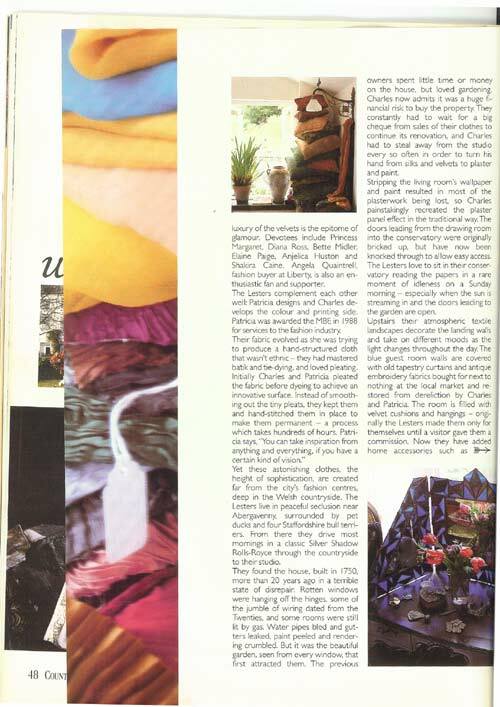 After a while, however, she became fed up with designing motifs for the likes of Christian Lacroix, Perry Ellis and Calvin Klein, who stuck them on textiles she had not chosen, or cut them into dresses that she felt no connection with. “It sounded good, but it was not satisfying,” she says. Now she is designing her own fabrics and making her own-label stools and cushions, as well as scarves. 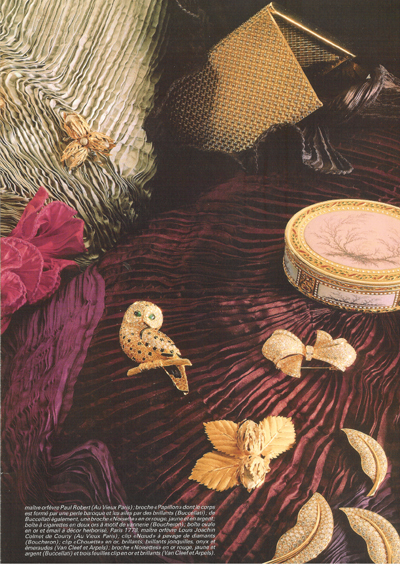 Crosland is an elegant willowy shape, and wears unostentatiously fashionable clothes. She has a cool glamour. But when she handles her opulent velvets and jacquards, and you get her talking about the technicalities of producing them, her neutral, businesslike aura disappears. She becomes as intense as someone at prayer. This, for her, is a passion. “I was doing fine art when I had my ‘calling’,” Crosland says. “I got lost in the textiles department on the way to a lecture at the V&A.” She has been tied to a print table ever since. Her style has an airy and graphic modernism. There are strong contrasts and outlines, whether the pattern derives from North African tiles, Constructivist zigzags, or Japanese flower motifs. 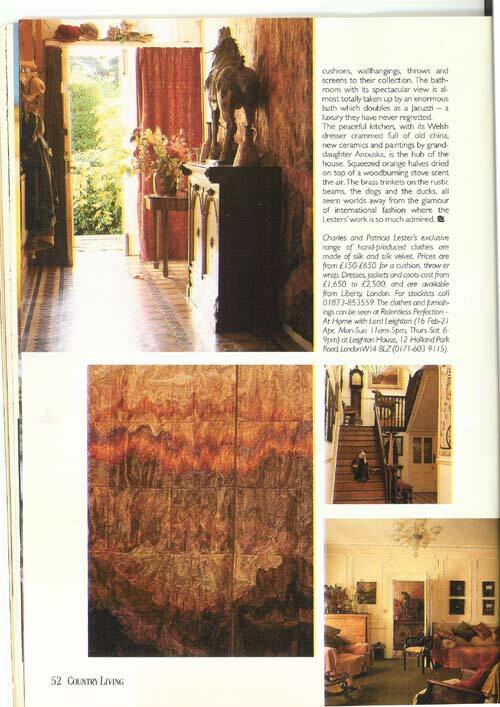 In her textures and rich colours, Crosland has recreated the depth and patina of antique textiles and ecclesiastical garments. 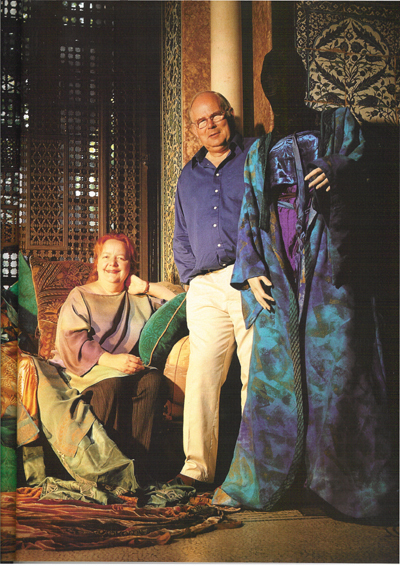 Pictures: Wall game: Patricia and Charles Lester made their name within the fashion world with beautifully-dyed pleated silk dresses. Now, at the pair’s base in Abergavenny, they bring similar techniques to designing textiles for interiors (left), including their huge, colourful wall-hangings and quilts. 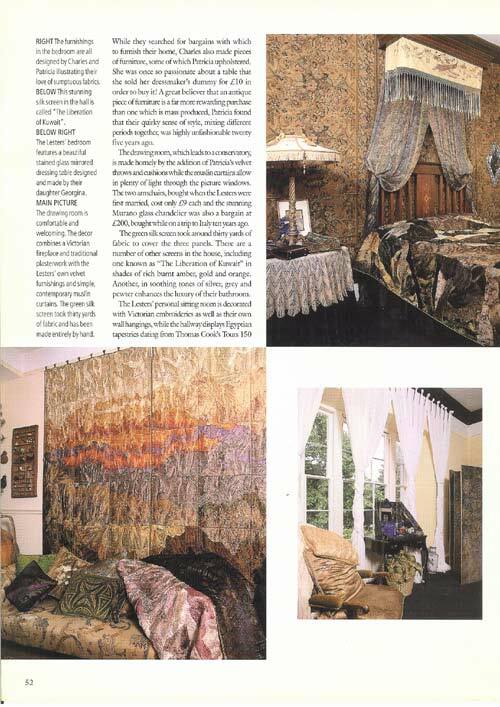 Charles and Patricia Lester’s home has featured in many publications as well as their designs. Substantial damage occurred, including the loss of the roof. Even worse, as it occurred during the miners’ strike, the couple had to eat by candlelight during the power cuts. 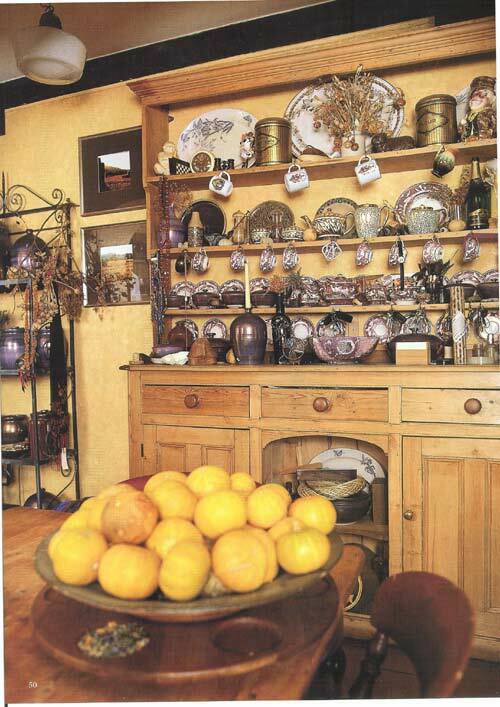 ‘The fact that the house had previously been divided into three flats meant that the best kitchen was on the top floor, so we had to cook up there and bring the food down to the ground floor to eat it,’ recalls Charles. Located in grounds featuring mature trees and a pond, the house is accompanied by a ruined chapel that the couple built beside it. Ruins are a bit of an obsession for Charles and Patricia, who collect stone wherever they find interesting buildings being demolished, and hoard it for future projects. 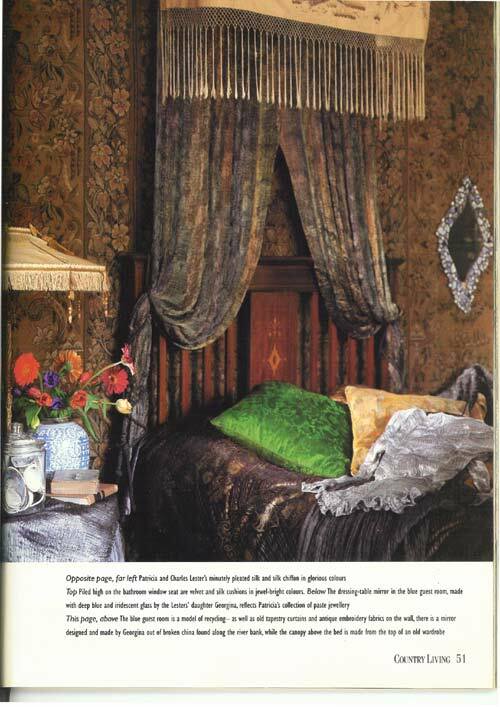 This passion for the past means that their home’s interior also exudes a timeless quality. However, the couple don’t despise mod cons by any means. The kitchen is an efficient space, while comfort is an important part of all the reception rooms. 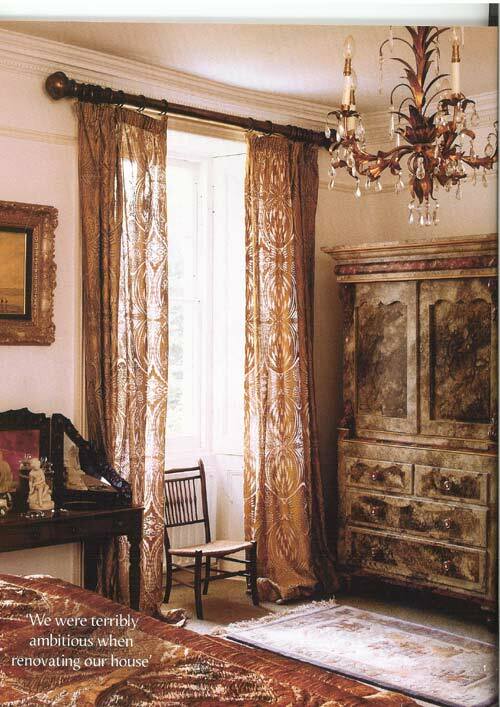 One of the most striking aspects of the house is the collection of pleated silk wall hangings. 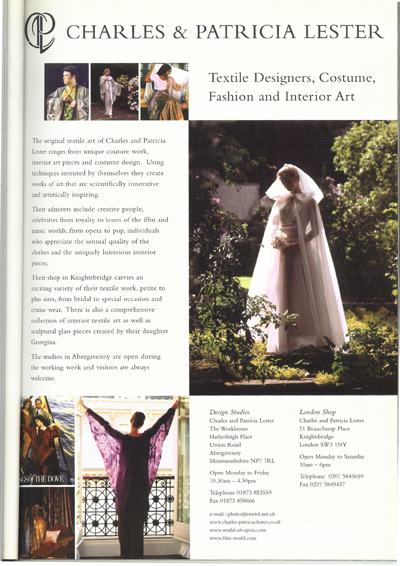 Patricia devised the technique for using signature hand pleated fabric to create tapestries and, with Charles, has transformed her little dressmaking company into a business that supplies fashion and textiles to the worlds of film, stage and opera. 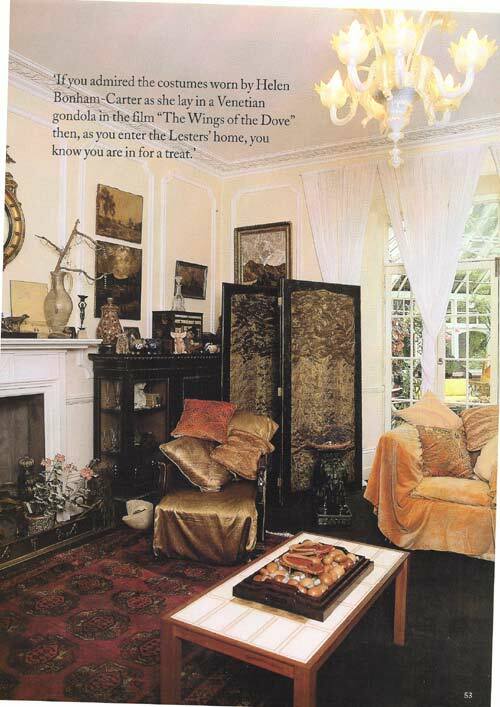 The couple’s work has appeared in the film The Wings of the Dove and celebrities such as Elizabeth Taylor and Barbra Streisand regularly buy from their collections. 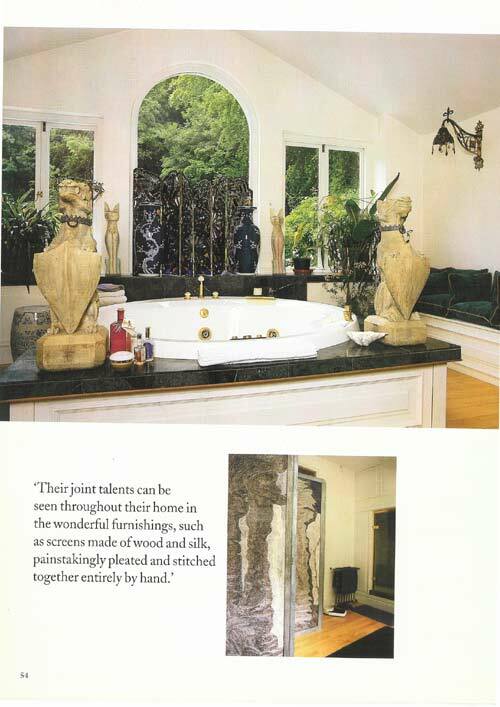 So it’s not surprising that, when decorating their home, the Lesters hung what they call ‘wearable art’ on the walls. 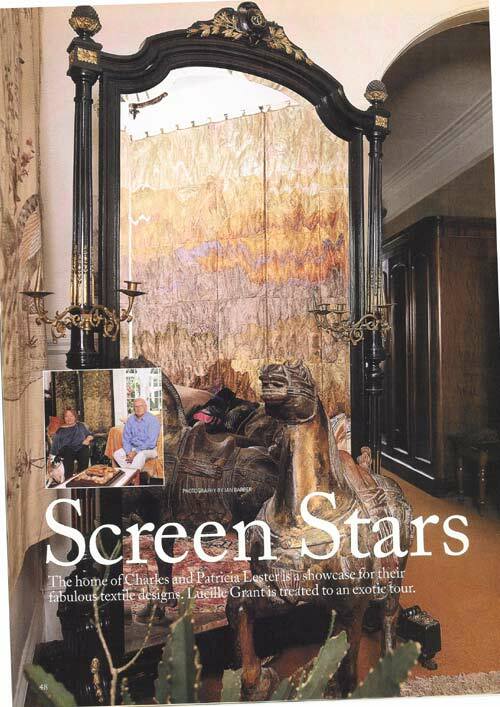 One particularly impressive item is the wall-hanging on the sitting area/landing, which was inspired by the burning oil wells of the first Gulf War, and required 100 yards of silk. 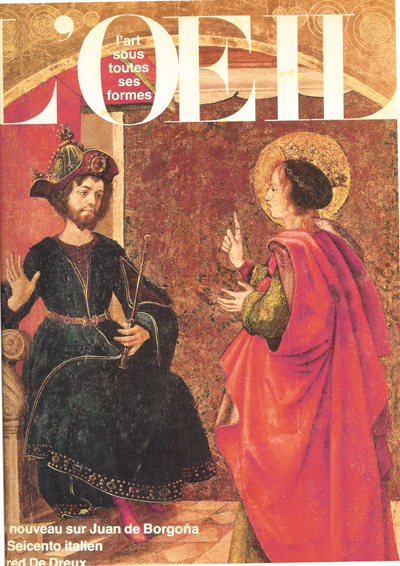 ‘You “lose” about two thirds of the fabric in the pleating and stitching,’ explains Charles. 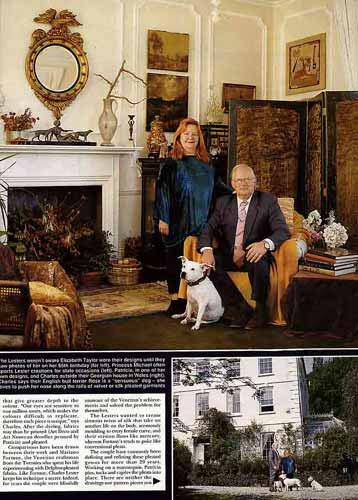 Perhaps it’s fortunate that, when this old house came on the market, the Lesters were there to snap it up. Their flair is the perfect match for this grand old property and, despite the disasters of the early days, the couple have no doubt that buying their home was one of the best decisions they have ever made.